There are all sorts of exclusive clubs on Wall Street -- and then there's Warren Buffett's Berkshire Hathaway (BRK-A). On Thursday, it became the only member of the $200,000-a-share club. That's right: A single share of its Class A stock is trading for more than $200,000. And Berkshire is likely to remain the sole member of that club for a very long time. The next-highest priced stock is Tower Properties (TPRP), a real estate holding company that trades over the counter for $10,500 a share. Some critics have argued for years that Berkshire is overvalued, but it has marched steadily higher year after year. According to Howard Silverblatt, senior index analyst at S&P Dow Jones Indices, Berkshire has delivered an annual return of 22.6 percent (including reinvested dividends) ever since the stock topped $100 a share back in 1977. That's a record of consistently outstanding performance unmatched by any other Wall Street guru. That means, if you invested $1,000 in Berkshire stock in May of 1977 and let it ride, your investment would be worth $2 million today. The stock is up 13 percent so far this year, well ahead of the 5.6 percent gain for the S&P 500 (^GSPC). Berkshire Hathaway is basically a mutual fund of Buffett's investments, including dozens of companies that he's bought and operated, as well as huge stakes in other publicly traded stocks. The company's biggest stock holdings are in Wells Fargo (WFC) (more than $23 billion worth of stock) and in Coca-Cola (KO) (more than $16- billion). Buffett has also placed big bets on financial companies American Express (AXP) and Goldman Sachs (GS), energy giants Exxon Mobil (XOM) and ConocoPhillips (COP), DirecTV (DTV), DaVita Healthcare (DVA), and many others. Buffett has long preached a buy-and-hold investment strategy, and he's maintained investments in many of these companies for several decades. In addition to those stock market investments, Berkshire also owns a long list of insurance, railroad, energy and consumer business. Among the best-known brands are Geico, Burlington Northern Santa Fe, Fruit of the Loom, Dairy Queen and Mars. Last year, Berkshire acquired H.J. Heinz. But unlike most other big-time buyout specialists, Buffett and partner Charlie Munger usually keep the existing management and staff of the companies being bought. Just like his stock market strategy, he buys with a long-term view, not so worried about the quarter-to-quarter gyrations that dominate Wall Street trading. 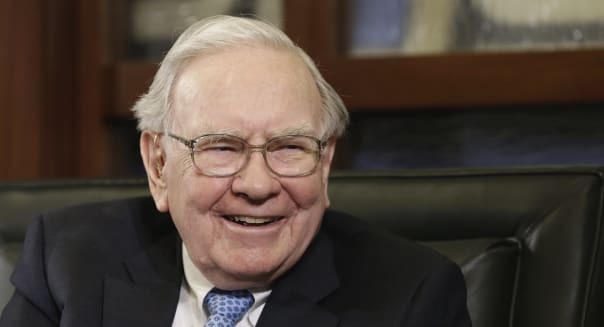 Buffett is widely considered an investment genius, and his nickname of the "Oracle of Omaha" reflects that he still lives in that same Nebraska city where he was born. Each year, tens of thousand of Berkshire Hathaway investors flock to Omaha for the company's annual Investor Day activities, hoping that some of Buffett's wisdom will rub off on them. Buffett, who turns 84 later this month, was ranked as the world's richest person back in 2008, before he started giving billions of his vast fortune, primarily through the Bill & Melinda Gates Foundation. Unlike most companies, Berkshire has refused to split its stock to make it more affordable for investors. Buffett believes the high price encourages investors to be more like him -- willing to place long-term bets on the American economy.